A traditional food of the Middle East and Northeastern Africa, freekah has recently made its way into Western food culture. It’s not a common grain seen in many Western kitchens, but I think it has the potential to catch the interest of many home cooks and chefs. High in fiber and iron, and a good source of niacin, vitamin B6 and magnesium, freekah is great to use in place of brown rice, bulgar or barley in dishes like soups, pilafs, risottos and salads. If you haven’t tried it yet, it is similar to bulgar, but the flavor is a little more complex and color is a little darker and greener. A bit smoky, it’s an earthy grain made from green wheat that goes through a roasting process in its production. The wheat is harvested while the grain is still green and soft. Then, it is piled, sun-dried, carefully roasted over open fires, and finally beaten to remove the chaff. 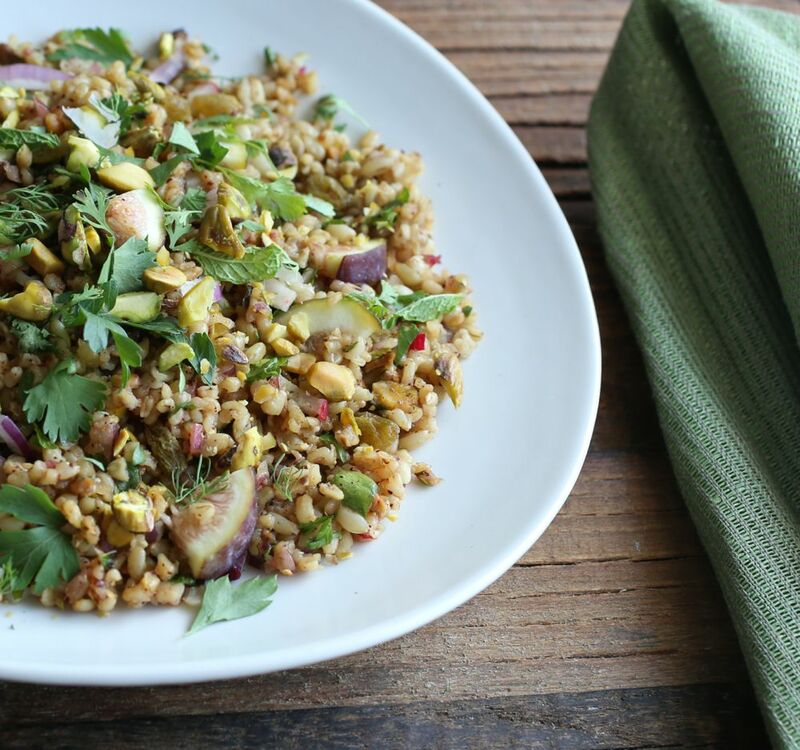 The cracked wheat, more accessible in the U.S., has an herbal quality that makes it great for use in slightly tart salads like this one. 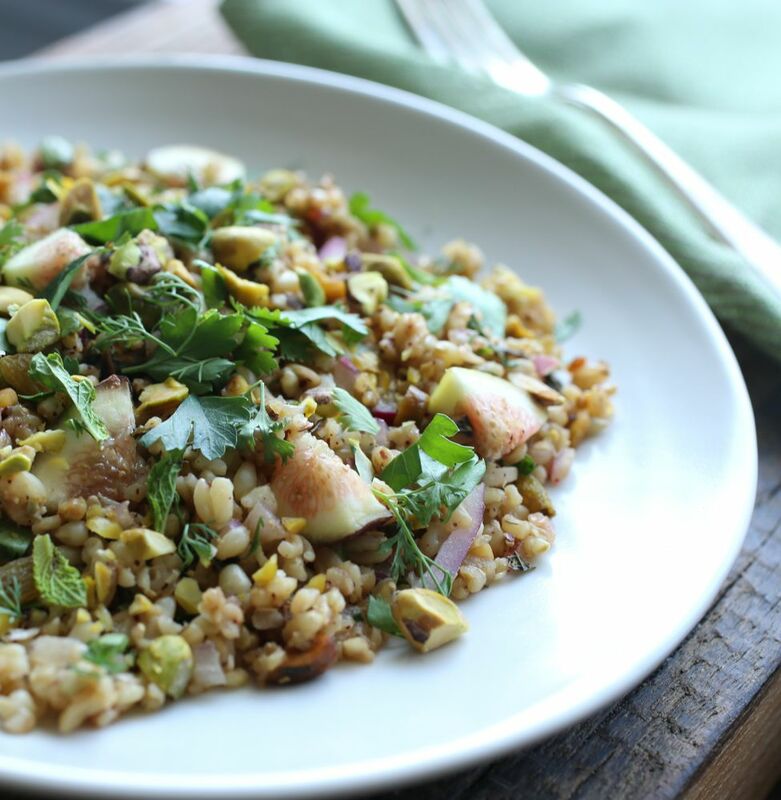 Here, freekeh is tossed with red onions, figs, pistachios and bright green herbs. After I made and photographed this salad, I decided to toss in cooked chickpeas that I had tossed in olive oil and salt. It was delicious! Bring a saucepan of water to boil, add freekah, reduce the heat to low, and cook until freekah is tender, about 25-30 minutes. Drain and transfer to a bowl to slightly cool. In a large bowl combine the onion and radishes and toss. Add cooled freekah along with the remaining ingredients and toss to combine. For the pomegranate dressing, whisk all the ingredients in a small bowl to combine, then season with salt. Toss dressing into freekah salad mixture. Taste and add more lemon juice if desired. Garnish with herbs and serve. This recipe looks so delicious! Yum! What a great recipe. It’s just how I like to eat.